Draw more attention and advertise an upcoming trade show, event or promotion by displaying custom feather flags or feather banners. 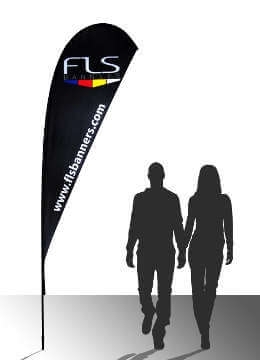 FLS Banners crafts the highest-quality feather flags, made to order. 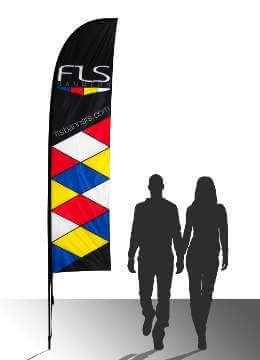 We offer custom printed feather flags complete with your own logo or design. We use the latest technology in printing, sublimation, and design. Choose from our extensive list of stock colors or submit your own designs using our easy submission process. Feather flags, also known as feather banners, bow flags, advertising flags, and sail flags are lightweight, free-standing and very portable. Custom feather flags or custom feather banners are made from sturdy material that offers vibrant printed colors and will stand up to various weather conditions. Promotional banners and flags are also very economical allowing business owners to easily change out custom colors or messaging while using the same hardware. Additional shapes include convex feather flags, concave feather flags and square feather flags. Our teardrop feather flag banners are perfect for marketing and directing attention to corporate and sporting events, retail open for business feather banners and auto dealerships. Custom Feather Flag Banners offer the maximum print area for both indoor and outdoor events. 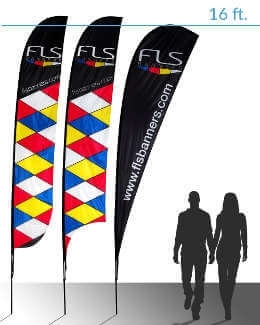 FLS Banners carries a variety of feather flag shapes including: Convex, Concave, Square, Swooper, Teardrop, and Teardrop XL shapes. 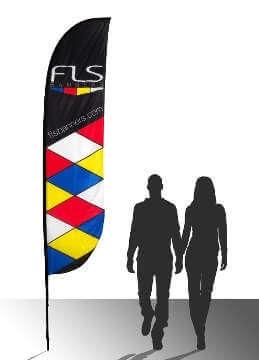 Each unique flag shape is designed to catch the eye and fit with the theme of your own trade show display or event booth. 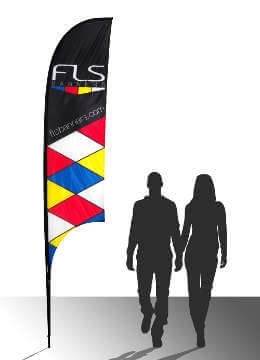 Advertising Swooper flags make it easy to attract attention and display your brand design or message. Teardrop bow shaped flags are held open at all times thanks to firm hardware and the bow at the top. They don't require a breeze to be read or seen—and are the only version that can be read correctly on both sides. 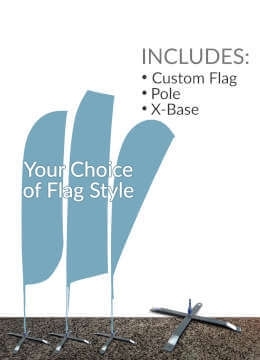 Select from a variety of convenient feather flag kit options. 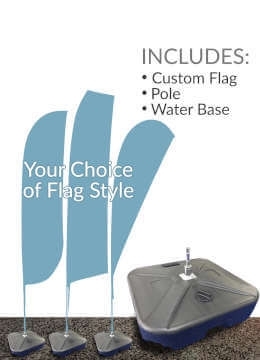 Each flag kit contains mounting hardware, such as: poles, ground spikes, x-base or water base and the flag itself. 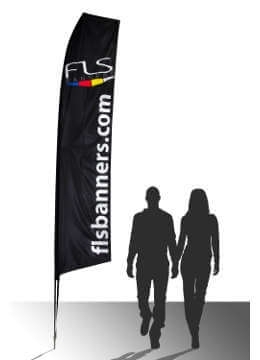 FLS Banners truly makes it easy to find the perfect display or feather banner thanks to our flexible customization. Besides coming with a ground stake for outdoor use, our advertising, teardrop bow and feather flags are also available with an x-base stand for indoor use and can nicely add vertical height to trade show booths. We also offer a weight-based option that can be filled with water for use on hard outdoor surfaces. 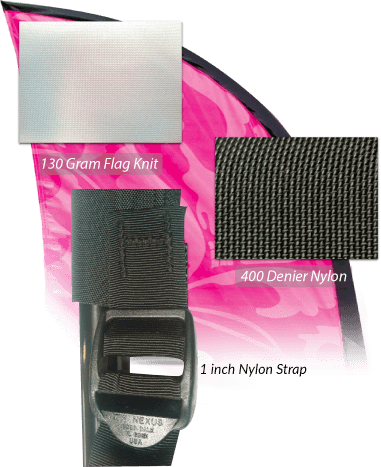 Order the kit that best fits your needs based on indoor or outdoor use or specific hardware if you would like multiple options. After deciding whether you would like a natural flag that will flutter in the breeze or one that will stay firmly open, choose your size options from 8 ft small, 13ft medium or 17 ft large. 8 Foot - At 8 ft size, the display flags are perfect for indoor events because they are more compact but still grab attention. 13 Foot - 13 ft size advertising flags are a great choice for outdoor events or even large indoor expos. 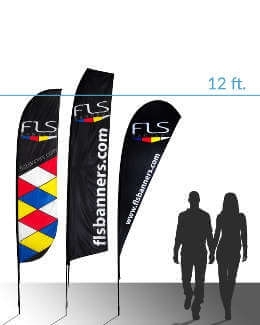 17 Foot - Our largest business flag at 17 ft towers over your display easily showing off your own logo or message. These are best suited for outdoor events because of their large size. 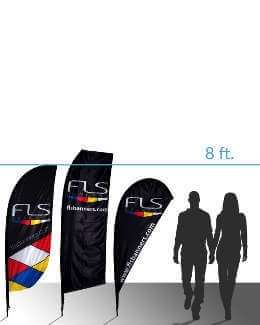 FLS Banners makes the custom flag size selection process easy by offering three sizes that fits any occasion. Feather Banner or Feather Flag? Feather banners and feather flags are known by many names. While what they are called may differ, they all serve the same function, an eye-catching and effective display banner for your business or event. These flags can be referred to as: feather flags, banner flags, bow flags, razor flags, blade flags, swooper flags, sail flags or wind flags. In addition to these names, there can also be teardrop feather flags, vertical feather flags, and outdoor feather flags - perfect for sidewalks, roadsides, and or outdoor events. They can also be used as open for business flags or promo flags. Now that we have established the identity of this type of promotional sign, let’s get into detail of size, shape, and printing options. 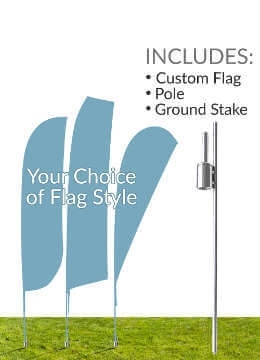 We only use the best materials for our feather flags: 130 Gram 100% polyester flag knit fabric long-wearing and will not mildew or mold, 400 Denier nylon pole pocket certain to outlast the flag itself, and an adjustable 1-inch nylon strap pull-down to get the look just right. For custom flag banner construction, we start with 130-gram fabric for the flag, which is one of the heaviest you'll find and as our testing shows, it's just right. Then, we then attach a 400 denier nylon pocket using a 5 thread overlock sewing machine using PTFE thread. The adjustable 1-inch nylon pull down is attached to the flag with a bar tack sewing machine for strength. Everything we do in constructing your flag is designed to make it stronger and eliminate the typical weaknesses. The highest quality print is so important to us that we have installed one of the most cutting edge direct to fabric printer platforms available: The Mimaki Tx500. This print platform enables us to produce high-resolution production at high speeds and delivers the Best 2 Sided Color in the market. No matter the quantity 1, 1000, or more we will exceed your needs. With 38 Years of experience and second generation ownership, this is what we were born to do. Mimaki has announced that its Sb300 series dye-sublimation inks for the TX500-1800 textile printer have been awarded an Eco-passport certification. It's GREEN for you and the environment! If you do not see what you are looking for, have additional questions about our products, or our custom printing process, contact us right away! 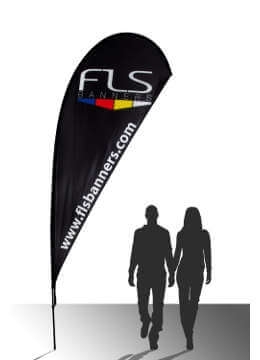 FLS Banners is known for our remarkable customer service. One of our team members is ready to help you get exactly what you need, exactly the way you want it. We offer a three-day turnaround, on most of our products. Feather flags are easy to order and get to you fast!